Status: Rare casual summer visitor west. Accidental breeder Kimball Co. Documentation: Description: Photographs 9 Jul 2007 Kimball Co (Mollhoff et al 2008, Brogie 2008). Taxonomy: Two weakly-differentiated subspecies are recognized, pertinax of Baja California, and cinerascens of southwest USA and western Mexico (Pyle 1997). Nebraska birds are cinerascens. Summer: A single bird was found in Kimball Co 28 Jun 2007, photographed 9-10 Jul, and subsequently the presence of a breeding pair there was confirmed 15 Jul with adults feeding fledged young 18 Jul (Mollhoff et al 2008, Mollhoff 2008); the last sighting was of a single adult 11 Aug. A single bird was at the same location 22 Jun-5 Jul 2009 (Brogie 2009a). The first, and only other, documented record for the state was of one seen near the White River north of Chadron, Dawes Co 29 Aug 1987 (Mollhoff 1989, Williams 1988). There are four additional sightings in Scotts Bluff and Sioux Cos. One was in a yard near Morrill, Scotts Bluff Co 12 Jul 2009, but the sighting was not accepted by the NOURC (Brogie 2009a). Another, seen at Riverside Park, Scottsbluff, 4 Sep 2000 by an experienced observer, was also not accepted by the NOURC (Jorgensen 2002). A calling bird was identified by observers experienced with the species in Colorado in lower Sowbelly Canyon, Sioux Co 20 Jul 2000. One was well-described at Wind Springs Ranch, Sioux Co 4 May 2009. 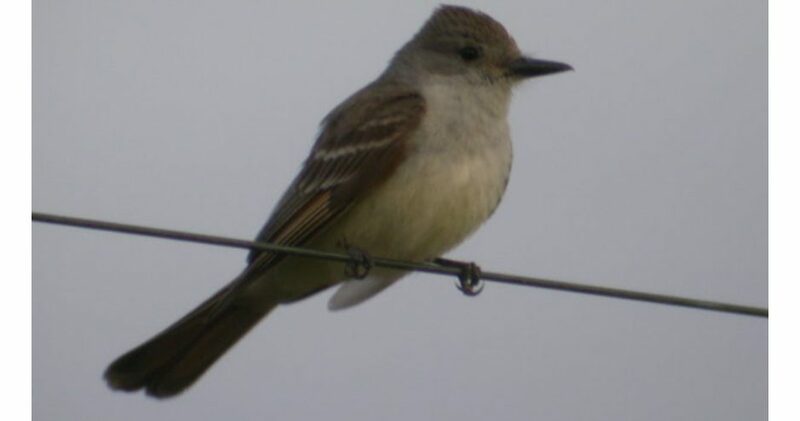 Comments: There are a number of records in southeast Wyoming and northeast Colorado of Ash-throated Flycatcher (eBird.org, accessed March 2017). The species is an established breeder in extreme southwestern Kansas (Thompson et al 2011). There are no records for South Dakota (Tallman et al 2002) or Iowa (IOU 2018). Photograph (top) of an Ash-throated Flycatcher at Pine Bluffs, Kimball Co 10 Jul 2007 by Joseph Gubanyi. Iowa Ornithologists’ Union [IOU]. 2018. Ash-throated Flycatcher records. Iowa Records Committee reports of Iowa rare bird records, accessed 30 April 2018. Mollhoff, W.J., J. Gubanyi, and M.A. Brogie. 2008. First report of Ash-throated Flycatcher (Myiarchus cinerascens) breeding in the Nebraska Panhandle. NBR 76: 32-37. Williams, F. 1988. Southern Great Plains Region. American Birds 42: 96-100.